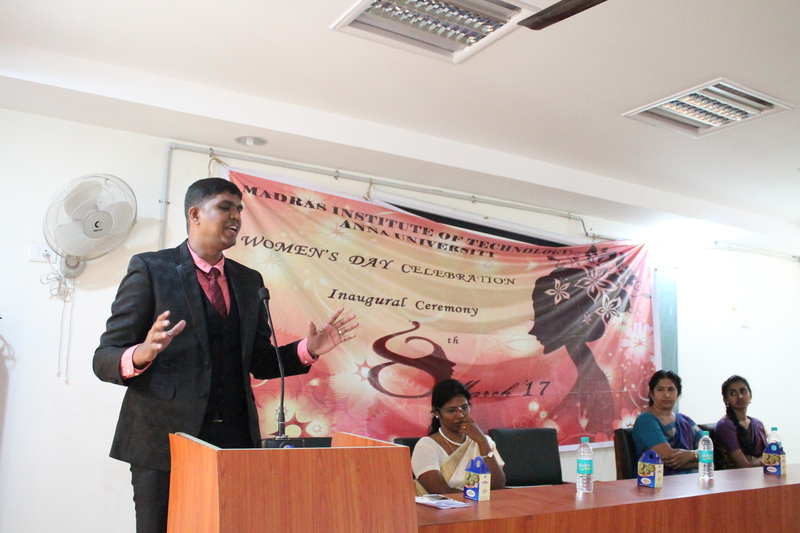 Women’s day was celebrated in the MIT campus on March 8, with a range of exciting events. The inaugural ceremony for the celebration was held at the conference hall in Rajam lecture hall complex at 10:00 am. A vast majority of the final year female organizers wore a saree to commemorate the celebration. Most of the events were exclusively open for women. The teachers were also seen having a great time during the celebration with their very own choice of attire showing unity in departments. More than 500 students participated in the competitions held which were for the benefit of the female students and as a means of encouragement to them. The title event, Miss Phoenix saw the most participants with other competitions like mehendi, ice bucket challenge and quilling following not very far behind. The title event tested the participants in fields like current affairs and also had a multitude of rounds like just adzap, talent exhibit and interview. Events like treasure hunt pumped up the adrenaline and left the participants hunting for clues and panting for breaths whereas in the other hand events like nail art left the contestants sitting motionless and patient until the polish dried out. The other events conducted were tug of war, cooking, rangoli, connections and much more. This entry was posted in Campus, General, Report. Bookmark the permalink.